This article will guide you to use our new and improved import system. On our Web Platform (www.sellf.io) you can easily import your data to Sellf. The supported formats are Excel (XLSX), Comma Separated Value (CSV) and Text (TXT). You can Import People, Companies, Deals and Products. The Import will help you to create new entities in your Sellf account or update the existing ones. To learn how to import data to Sellf from spreadsheets, watch the following video or read the instructions below. 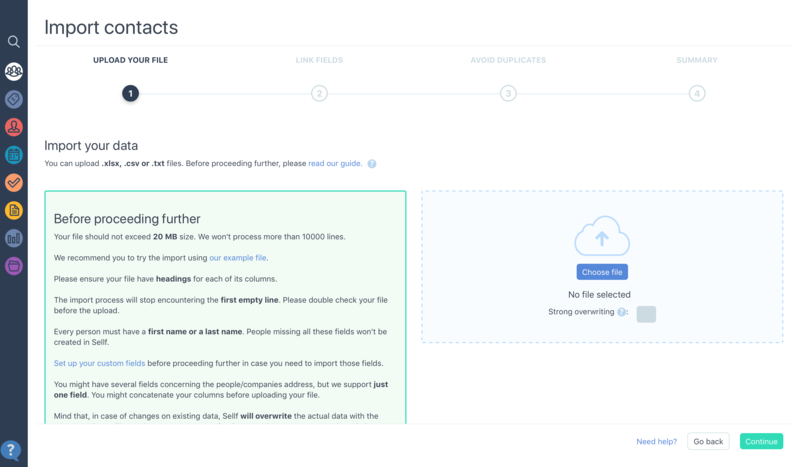 Before you import, it's important to understand what kind of data you want to create in Sellf and how this information will be presented after the import. You can Import People, Companies, Deals and Products. The choice greatly depends on the actions you’re going to perform with this data. Important: We recommend using our Excel example templates to ensure your data is formatted properly. You'll be given the option to download the templates during the import process. It's a good idea to do a test with a smaller import file first to make sure your file works. We also recommend that you use a new spreadsheet without any formulas. If you have a spreadsheet that uses formulas just copy the data and paste into a new column. (Right key> Paste Special > Values only). In this section you will be able to import a list of People & Companies at the same time. People are contacts you’re selling to, not team users in your company account. These profiles hold all long-term information, such as phone numbers and email addresses. 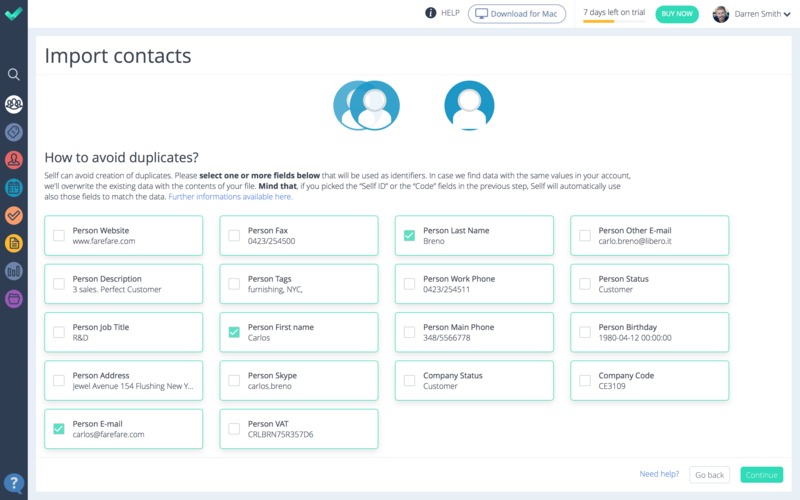 People are connected to Companies as employees, so when you have Person data and Company data in the same row in your file, Sellf will create a Person Profile and a Company Profile linked together. If in your spreadsheet some People has no Company data, Sellf will only create the Person profile. If in your spreadsheet file you have more People belonging to the same Company, Sellf will create as many Profiles as People in your file. In this case you could have the Company data repeated on more than one row. 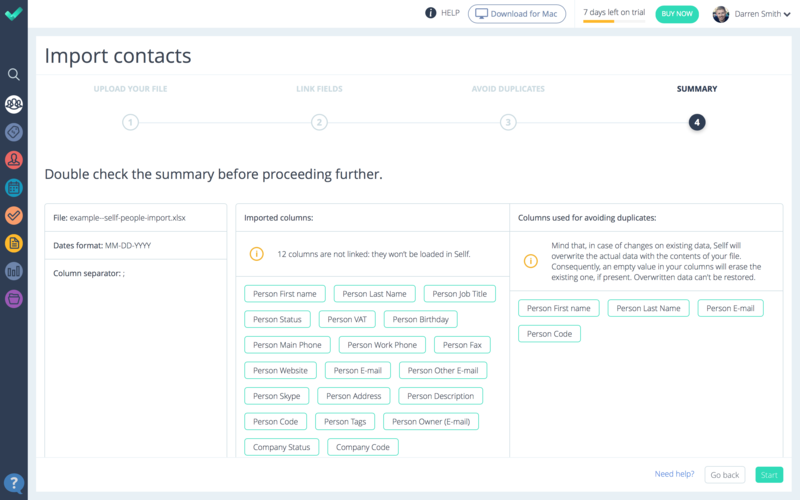 In order to avoid duplicates for the Company, you’ll need to select an identifier field for the Company, such as an email address or a Company Code. Please, read carefully how to avoid duplicates in the Step 3.
you want to update your Contacts records in your Sellf account. Please, download our formatted Excel example template to ensure your data is formatted properly and get best results. In this section you will be able to import a list of Companies (Customers or Potential customers). you want to update your Companies records in your Sellf account. In this section you will be able to import a list of your Deals, visual representations of what you’re selling to your customers. They're tracked through the stages of a sales Pipeline as they progress and document all actions taken to close the sale from start to finish. You can import active deals (in progress) or closed deals (won/lost/abandoned). People and Companies can be also added to your deals in the same row in your file. They will be connected as main customers in your Sellf account. You can also link deals to your Sales Campaigns (running or not), by adding a column with the Sellf ID code of your Sales Campaigns. you want to update your Deals data in your Sellf account (and their main customers). In this section you will be able to import a list of your Products, goods that your sales team is selling, they can be physical objects or services. More info about products are available here. you want to update your Products data in your Sellf account. Populate your own data in these spreadsheet templates, or use them to at least understand how data are organized in Sellf. The fields below are mandatory to create your records in Sellf. Every Person must have a first name or a last name. People missing all these fields won't be created in Sellf. Every Company must have a name. Companies missing this field won't be created in Sellf. Every Deal must have a Description (name) and a Stage. Deals missing these fields won't be created in Sellf. In order to associate a stage using just its name, the name of the sales Pipeline is required too. Every Product must have a name. Products missing this field won't be created in Sellf. Your file should not exceed 20 MB size. We won't process more than 10000 lines. If your file is larger exceeds these limits, we suggest you break it up into multiple files. Cells in your file can not be longer than 255 characters, except for Description Field. If you import data that is more than 255 characters into a cells then the record will not be imported. Please ensure your file have headings for each of its columns. The import process will stop encountering the first empty line. Please double check your file before the upload. 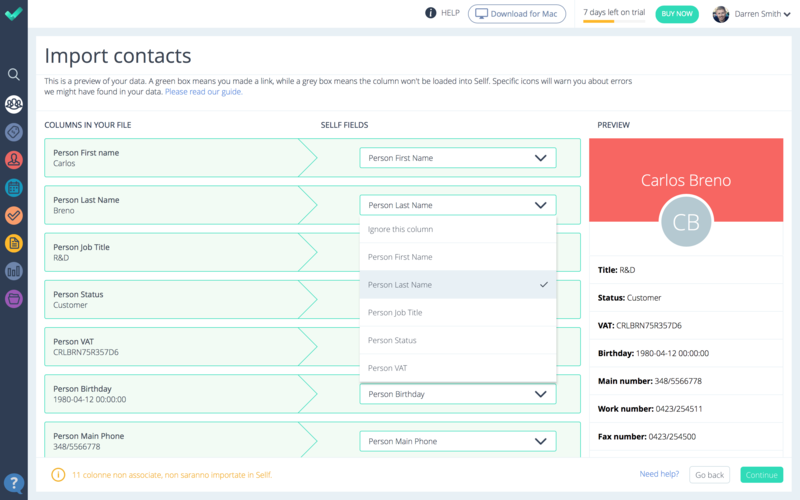 Contacts (People & Companies) may have an address divided into several columns, but only one of these columns can be mapped in Sellf. You can unify them with the "Concatenate" function in Excel. Remember that you should copy the textual results of the concatenate function into a new column to let the import succeed. (Right key > Paste Special > Values only). In case of changes on existing data, Sellf will overwrite the actual data with the contents of your file. By the way, an empty value in your columns won't erase the existing one, if present and existing tags won't be replaced. To force the overwrite also in these particular cases you have to check the Strong overwriting checkbox when you select the file to import. In any case, overwritten data could eventually be reverted later. By default, we'll try to identify your file encoding. In case we can't recognize the encoding of your data we'll use UTF-8 (Unicode). 1. 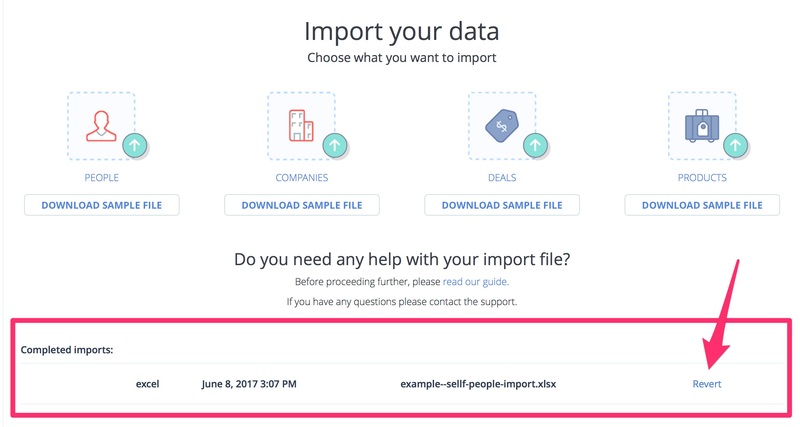 Sign into Sellf web (www.sellf.io) and navigate to "Settings" > "Data" > "Import". 2. In this screen, select the data type you want to import: People, Companies, Deals or Products. 3. Click on “Choose file” to upload your file. Please, read carefully the information in the previous paragraph to get your file ready for the import. If you upload a CSV file, Sellf will ask you to pick the dates format of your file. Check the box "Strong overwriting" if you want to overwrite some data, like tags, or delete some data by importing empty values. 5. In this step you have to link the columns in your spreadsheet to the different fields in Sellf. On the left you can see a preview your columns data. On the right the different fields in Sellf. You cannot link more than one column to a Sellf field. If the imported column headers match the field values in Sellf, then the respective titles are automatically selected and the boxes will be green. A green box means you made a correct link, while a grey box means the column won’t be imported into Sellf. If the auto-recognition failed for any of your fields (grey boxes), you can still select the Sellf fields to their appropriate spreadsheet columns from the dropdown menu. Do you have columns that do not match these Sellf fields? Set up your custom fields before you import so you can import to those fields. They will appear in the dropdown menu. Click here to learn how to create custom fields. Sellf will let you know of any fields that are not matched correctly with Sellf fields and any errors you might have in your data. Correct links will complete a preview of what you’re importing (People, Companies, Deals or Products). The card makes it clear how your data will appear in Sellf after the import. 6. Once completed, click “Continue”. You can assign a People, Companies and Deals to your team collaborators. You need to include a column in your file labeled ‘Person Owner (E-mail)’ that you will match to the Owner field in Sellf. In this column, write the e-mail address of the user in your account you want to assign data to. Important: remember that you must have active users in your account (they accepted your invite to collaborate in Sellf) before importing, otherwise data will not be imported. Sellf can avoid creation of duplicates. In this step you'll be given the option to have Sellf recognize and merge data together. Or you could opt to bypass this step, in case you’re importing for the first time, you don’t have duplicates in your file and you don’t have existing records in Sellf. If, instead, you’re updating your data or you’re importing for the first time, but you already have existing records in Sellf, you have to tell Sellf how to preceed to merge your data. 7. Please select one or more fields that will be used as identifiers to merge your data. The benefit of this step is that YOU decide how Sellf recognize and merge duplicates together. Let’s say you import a list of People, obviously you may have People that have the same name. It’s not a good idea to select Name and Last Name as identifier fields only, as you may have namesakes, like in this example. Let’s select a third field as identifier, the e-mail address. The Contact John Mc Allen (john.mcallen@example.it) won’t be duplicated in Sellf, but the new data will be added to the existing record in Sellf. Person Main Phone will be added and tags will be updated, if you've checked the Strong overwriting checkbox when you selected the file to import. The Contact John Mc Allen (info@hoffman.com) will be created as a new record in Sellf, since no matching criteria is found. Important: In case a match is found, Sellf will overwrite the existing data with the contents of your file. In case of duplicates on few rows in your files, Sellf will select the last row to update the data. By the way, an empty value in your columns won't erase the existing one, if present and existing tags won't be replaced. To force the overwrite also in these particular cases you have to check the Strong overwriting checkbox when you select the file to import. Values in a multiple fields, such as tags, choices in a dropdown menu of a custom field, will be overwritten with the value in your file, as we’ve seen in the example before. Overwritten data can be restored using the "Revert" function. Let’s say you import a list of People and Companies where these people they work. People and Companies data will be on the same row, and you may have the same Compnay on more than one row, right? In order to avoid duplicates, you simply need to select an identifier for the Company. It could be the Name, the E-mail address or a combination of these fields. 8. Once completed, click “Continue”. 9. Please, double check the summary before proceeding further. 10. Once you've previewed your import, go ahead and select “Start”. Once you've performed an import, but you want to undo it and start over, you revert your import any time. 2. In this screen, you should see your completed imports at the bottom of the page. Select "Revert". Only Administrators and Managers can import files.